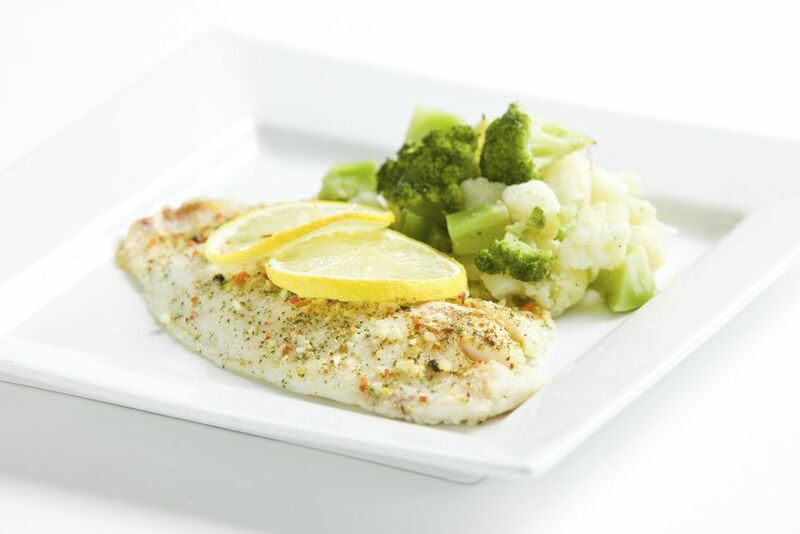 These lemon and herb baked tilapia filets are delicious and nutritious, and they're easy on the budget. Tilapia is a mild white fish. The average tilapia fillet weighs about 4 ounces, and it has only around 109 calories and 22 grams of protein. It's an excellent choice for the weight-conscious, and it's low in mercury. Tilapia fillets are thin and cook quickly. The straightforward preparation steps and quick baking time make this tilapia recipe perfect for a busy evening. The recipe takes no more than 30 minutes, start to finish! The butter, lemon, and herbs flavor the fish beautifully, and it makes a fabulous meal with hot cooked rice or a baked potato. Brussels sprouts or broccoli are fabulous with fish, but any steamed vegetable or salad would make a good side dish. You'll find some cooking tips and substitution ideas below the recipe. Heat the oven to 400 F (200 C/Gas 6). Butter a shallow 2-quart to 3-quart baking dish or a rimmed baking sheet. Slice the green onions, keeping the white and light green separate from the dark green tops. Zest the lemon and squeeze 1 tablespoon of juice into a small bowl. Add the lemon zest to the juice with the softened butter, chopped parsley, salt, pepper, and white and light green parts of the green onions. Place the tilapia fillets in the prepared baking dish, folding thinner ends under as necessary to keep them uniform in thickness. Spread the butter mixture over the fish fillets. Bake the tilapia fillets for about 12 to 15 minutes, or until the fish flakes easily with a fork. Garnish with the sliced green onion tops. Fish should be cooked to a minimum temperature of 145 F (63 C), or until the flesh is opaque and it flakes easily with a fork. If you have to divide a large fish fillet, cut it lengthwise down the center. Small individual baking dishes are convenient because they go from the oven to the table and they make a nice presentation. Omit the green onions and add another herb to the lemon butter mixture. Fresh chopped dill or fresh thyme are both good with fish. Replace the parsley with fresh chervil, or use about 1/2 teaspoon of dried chervil. Use a blend of herbs: 1 teaspoon of chopped fresh dill, 1 teaspoon of chopped fresh parsley, and 1 teaspoon of chopped fresh chervil. Add 1 teaspoon of finely minced fresh garlic to the butter mixture, or about 1/2 teaspoon of garlic powder.